Silverwood Lake State Recreation Area Campground (Mesa Campground) has 136 campsites for tents, trailers and RVs (up to 31 feet) on a hill above the lake. Each campsite has a table, fire ring and grate. Some of the sites have electric hookups. There are also 3 group campsites and some hike/bike campsites. The group campsites are 1/4 mile west of the park office on Cleghorn road. Each site can accommodate up to 100 people and 30 vehicles. The group sites have tables, BBQ, large fire ring and shade ramada, but no electric hookups. Campsites 1 thru 95 are available by reservation. The campground has Wi-Fi service (150 feet from the entrance kiosk), restrooms with flush toilets, showers (coin operated), drinking water, a dump station and campfire center. Silverwood Lake State Recreation Area offers a variety of outdoor recreation activities including camping, hiking, swimming, boating, waterskiing/watersports, fishing, biking/mountain biking, ATV/OHving, horseback riding and wildlife viewing. There is a marina with a launch ramp, boat and equipment rentals, and a camp store. 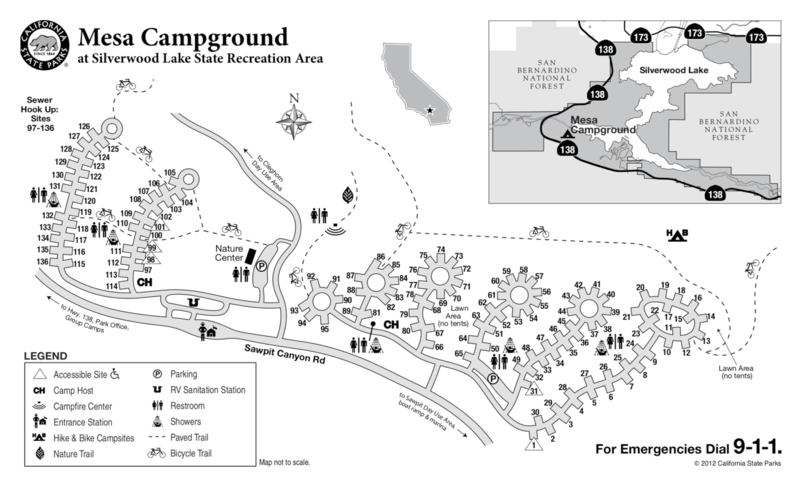 Dogwood campground is another nice option located in the mountains close to Lake Arrowhead. Visted Silverwood Lake State Recreation Area Campground lately? We'd love to hear about your adventure. Did you find us useful? Did we forget something? Anything our community should know before heading out to Silverwood Lake State Recreation Area? When were these pictures taken? I heard that site 1-13 is not as shady because of the 203 fire. Thank you. Is camping with a tent allowed on the camp grounds OR are there designated campgrounds for the use of a tent. Tent camping is allowed at Silverwood Lake State Recreation area campground. Does anyone know how soon group campsites are available at Silverwood. I’m trying to book something for next summer but it’s only allowing me to book out to March. For Silverwood Lake Campground reservations are available on the first day of the month, six months prior to arrival. For example, if you wanted to stay sometime in July, then the reservation window opens on January 1 at 8:00AM PST. Boat Rentals and Kayak rentals how much? How close are full hook up sites to the lake? Curious. I prepaid for my reservation online, and wanted to find out how check-in works? Is there a cut-off time? We’re coming up from San Diego after work, and expect to get in around 7-8pm on Friday. Are there showers? To take a shower after swimming in the lake. Yes, there are showers (coin operated) at Silverwood Lake State Recreation Area. Unfortunately the crew here at CampsitePhotos.com doesn’t know how much the showers cost at Silverwood Lake State Recreation Area. In other campgrounds the showers generally cost $1 (4 quarters or tokens) for 2-3 minutes. Can we put a tent and trailer (EWS) on the same site, if it is large enough? That depends on the campsite. Did you look at the photo of the campsite you have at Silverwood Lake State Recreation Area? Do the silver lake group site have elextricity? The three group campsites at Silverwood Lake State Recreation Area have tables, BBQ, large fire ring and shade ramada, but no electric hookups. The can accommodate up to 100 people and 30 vehicles. 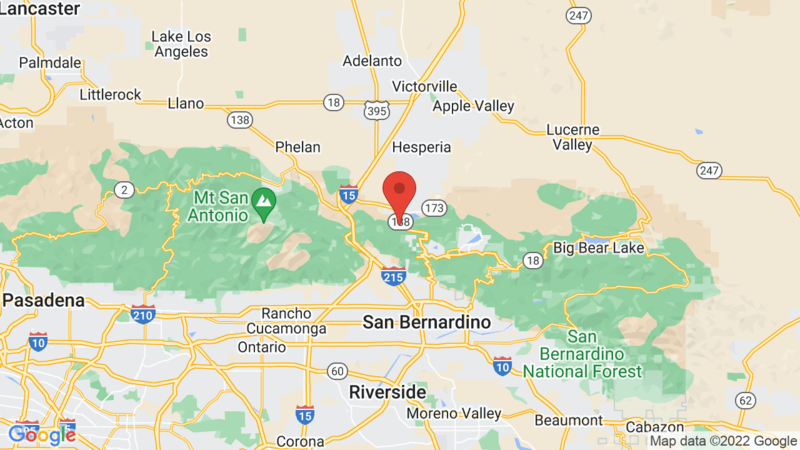 There are a few fire-roads/forest service roads that are within a mile of Silverwood Lake State Recreation Area and you can ride ATVs on these roads. Do you ever see any bears or bobcats? Is there any restrictions for food at night because of wild animals? There are bears and bobcats in the general area of Silverwood Lake State Recreation area, but they are rarely seen. It’s always a good idea to store food properly though as there are other critters about that will take advantage of a midnight snack if left laying around.